Thelypteris hexagonoptera. Michael Hough © 2004-2010. Botany Blog Plants of the Northeastern U.S. botany.thismia.com (Accessed 4/2017). 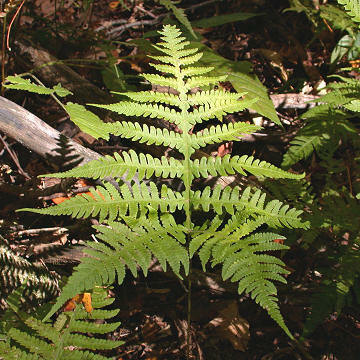 Thelypteris hexagonoptera is a fern to 80 cm tall, from a slender, creeping, branching scaly rhizome. Leaves deciduous, arising singly; leaf stalk hairy, somewhat scaly below, smooth above; blade twice pinnate, to 40 cm long, broadly triangular in outline, midrib winged, leaflets 10-15, to 7 cm wide, the lowest are the largest, midribs broadly winged, secondary leaflets 20 per side, tapered at both ends, irregularly, bluntly toothed or shallowly lobed. Spore cases scattered near leaflet margins at ends of veins.